Origin and Habitat: Central Mexico (San Luis Potosí, Querétaro, Guanajuato, Mexico D.F Hidalgo, Oaxaca). Cuttings from Stenocereus marginatus are widely used as barriers, often becoming living fences, and it is so widely used throughout Mexico that its geographic origin is uncertain. 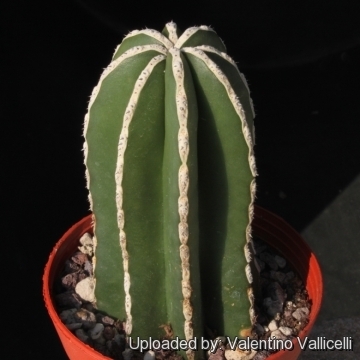 Stenocereus marginatus (DC.) A.Berger & Buxb. 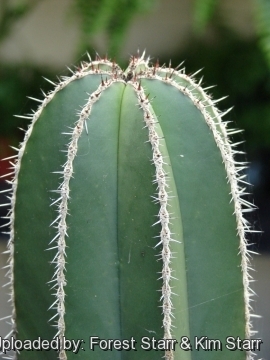 Pachycereus marginatus f. cristata hort. Stenocereus marginatus f. cristata hort. 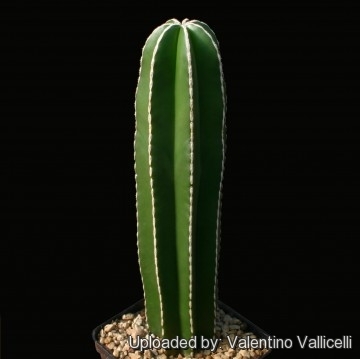 Description: Upright and clumping, stiff and imposing, columnar cactus with unbranched stems from the base. 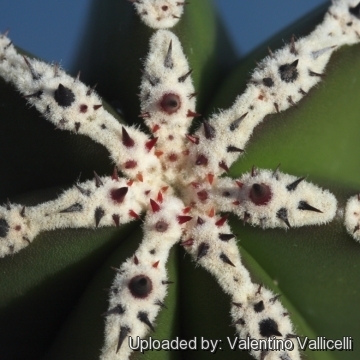 In the wild it grows up to 15 m in height, cultivated, it is columnar, up to 4 m tall or more. Stems: Erected, basally branching to 5-10(-20) cm thick, dark green. The epidermis surface is slightly rough to the feel, like sandpaper. Ribs: 5 to 7 (or more), 2 cm high. Areoles: White, glandular, mostly about 1cm apart, confluent forming an uninterrupted longitudinal line. 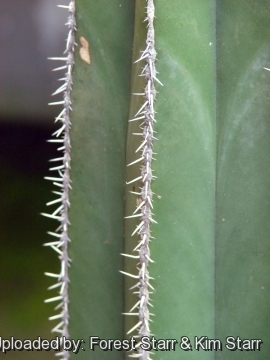 Spines: 1 yellowish central spine up to 1 cm long. 5-9(14) short radials. The spines are longer in the juvenile specimens, while are very short in the mature branches. Flowers: Pink to greenish, up to 2 in each areole, 3 to 4 cm inches long. Fruit: Spiny, yellowish to reddish, up to 4 cm in diameter, and rather dry in late spring to early summer. The many seeds are black. Pachycereus marginatus (DC.) 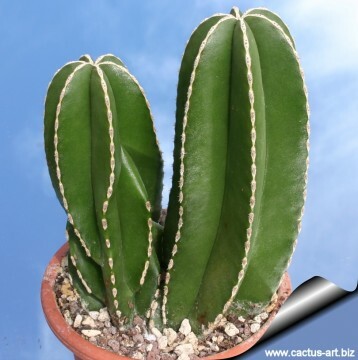 Britton & Rose: Solitary or branching columnar cactus with small spines along linear rows up and down the plant. 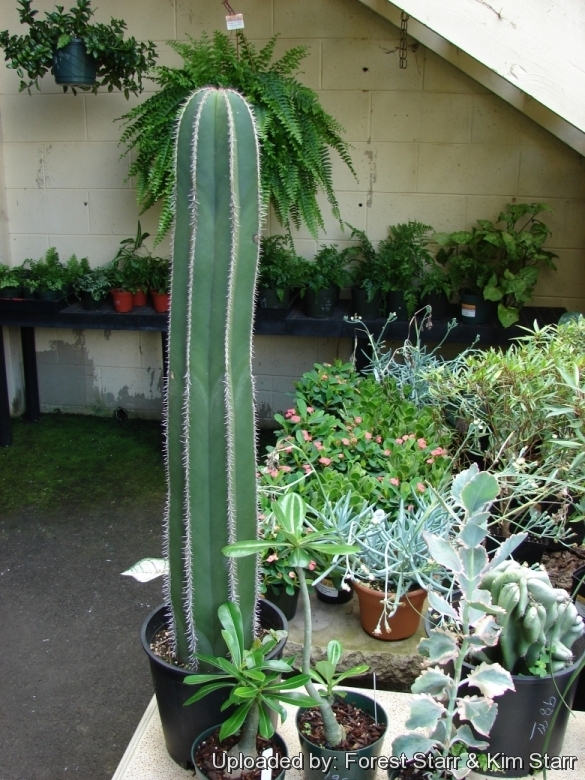 Pachycereus marginatus f. cristata hort. : Crested form with short spines along linear rows up and down the plant. 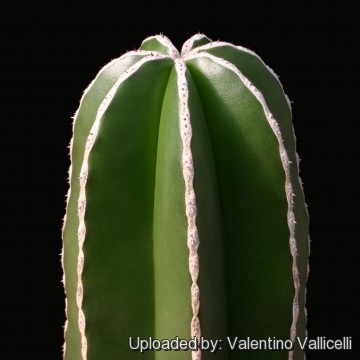 1) Forest & Kim Starr “Pachycereus marginatus (Central Mexico organ pipe). Plants of Hawaii. <http://www.starrenvironmental.com>. Downloaded on 20 August 2014. Cultivation and Propagation: It is easy to grow but not very cold hardy (Resistant as low as -4°C for a short time). Sun Exposure: Outside full sun, inside needs bright light, and some direct sun.. Need a fertile, well drained soil mix. In summer water the plants well and allow them to dry before watering again. During winter month, put them in a cool luminous place and encourage them to enter winter dormancy by withholding water and fertiliser over the winter as they will etiolate, or become thin, due to lower levels of light. They are susceptible to fungal diseases if overwatered, but are not nearly as sensitive as many other cacti, especially in warm weather. If kept damp through cold periods, they will invariably suffer. Plants grown outdoor in the ground produces exceptional amounts of growth, often more than 1 m each year if kept well fed and watered throughout the warmest months, particularly if it has been acclimatised to accept full sun. Defensive barriers: The stems are exceptionally straight, in Mexico, where it is extensively cultivated, they are often used to make live fences (a wall of these is hard to get through and/or see through). It is also useful to built effective wind break barrier. 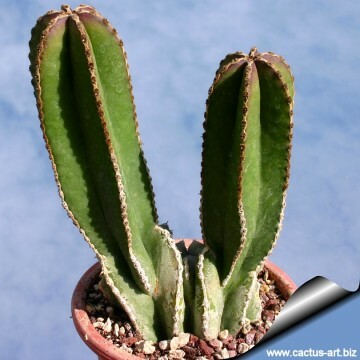 Landscape use: Specimen or focal point in the landscape, desert landscape design themes, similar to Organ Pipe cactus, but with a cleaner, sleek appearance. Not for use in small spaces. There are many cultivated varieties.